Liebster Award Nomination Update & Thank Yous! Morning, everyone! So, crazy story time: I just got nominated for the Liebster Award by two lovely people! This will officially make my fourth nomination for this award! Whaaaaat?! This is so insane and I am so appreciative of this. I was nominated by Y. Zheng (http://randomblogyz.wordpress.com/about/about-the-author/ ) and Annalissamarie (http://annalissamarie.wordpress.com/ ). I don’t know Annalissamarie very well, but after I checked out her blog, I can’t wait to get to know her more! Her blog covers beauty, fashion, and lifestyle, so there’s something for everyone! 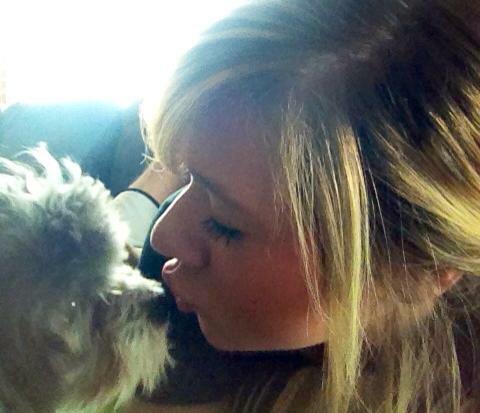 Plus, she has a Yorkie Poo. That’s enough to get me to be best friends with someone. haha Y. Zheng on the other hand, I made a connection with! We just kind of clicked right away! Y’s blog is some place I go whenever I need some relaxation or positivity in my life. Such an amazing writer! We’re constantly in each other’s comments supporting each other and chatting. (: I just wanna give a huuuuge shout out and thank you to the both of them for thinking of me for this award and for supporting me. Ya’ll are the best! 2. You must answer all 11 questions given to you by the person who nominated you. If you won a free airplane ticket to travel to anywhere in the world, where would it be? I would, without a doubt, pick a ticket back to my hometown of Dallas, Texas. I left when I was 13 or 14 years old and have missed it ever since. A few Christmases ago, one of my best friends that I’ve grown up with, Jake, was tragically killed in a car wreck. He was buried in Dallas and I would love the chance to be able to go visit his grave. A part of me will never be able to heal fully until I’m able to do that. What is the one word you dislike when people are using to describe you? hahah This is so funny to me because people use so many different words to describe me! My friends even say that I can be bitchy at times, but I take that as a compliment. I’ve been through a lot, I have a backbone, and I love that about me. My favorite thing though was, during high school, one of my good friends, Aaron, called me fearless. That stuck with me and that’s a word that I use to carry out my daily life! Love that. If you can change the name of a food, what would it be? Cheese curds. hahah What’s wrong with mozzarella sticks? Nothing, that’s what. Cheese curds sounds disgusting! If a stranger hands you a hundred dollar (pound, euro, whatever your currency), what would you spend it on? I’d put some away for my cosmetology program tuition that I’m attending this January and then I’d donate the rest to a local animal shelter. If you’re a reincarnation of a famous person, who would you want it to be? Well, she’s not dead, but if I could be any celebrity, I’d love to be Jennifer Lawrence for a day! People have told me that I act just like her that’s one of greatest compliments anyone could ever give me. haha I’m girl crushin’ on her! If you can have any job in the world, what would it be? A full-time blogger and a foster parent to dogs! That’s my dream. If you were a pop icon living a double life, what would your pop icon name be? Probably Megatron haha That was one of my nicknames in high school and people still call me that! If you can have an ice cream flavor named after you, what would be? Again, Megatron. And I’d have chocolate and carmel swirls in it because that’s my fave. Yummm. What is the one word you like people to describe you? Hilarious. I love it when people comment on my sense of humor. If you can time travel to any destination in time, what year would it be? This is so cliche, but I’d love to meet Jesus! If you can wake up to any sound, what would it be? I love the way I wake up now. With my fur babies stinky dog breath in my face, paws clicking on the floor, and tails wagging against stuff on my nightstand and knocking it off. Love my 5 dogs to the moon and back. What are your top 5 can’t live without products? I’m not gonna get into brands, but my top 5 makeup must-haves are foundation, concelear, primer, powder, and my setting spray. Who is your inspiration? My mom. (: She’s battled thyroid cancer and skin cancer several times, but she’s all good now! I’m so glad to have her fighting genes. I come from a strong family. Biggest splurge? Every time I go into Ulta or Sephora, it’s a bit of a splurge. haha I haven’t bought this yet, but I’m saving up for a Michael Kors bag and a Clarasonic Mia 2! Can’t wait. If you could style/ makeup any celebrity who would it be And what would you do? Lupita Nyong’o! I don’t know anything about fashion, but I’d loooove to style her because she takes the biggest fashion risks and always looks so stunning, beautiful, and flawless. Love that chick. Favorite makeup trend ? I think primers and face washes are really getting a moment right now and that makes me happy. I also love summer makeup because it’s so experimental and bright! Best make up tip/ advice ? ALWAYS ALWAYS ALWAYS WASH YOUR FACE AT NIGHT! Ladies, please! For the love of all that is good in this world, WASH YOUR FACE NIGHTLY!!!! I seriously cannot stress that enough. If you wanna see the blogs that I love please go check out the two lovely people who nominated me for this award and click on the link to my other awards to check my nominees out over there (: Another big thank you to Y and Annalissa for thinking of me! Ya’ll are so awesome and I can’t think you enough. I so appreciate this. Thank ya’ll for reading today and don’t forget to like and give me a follow if you haven’t already (: Talk to ya later! ← My Traumatizing Morning & Outfit of the Day!